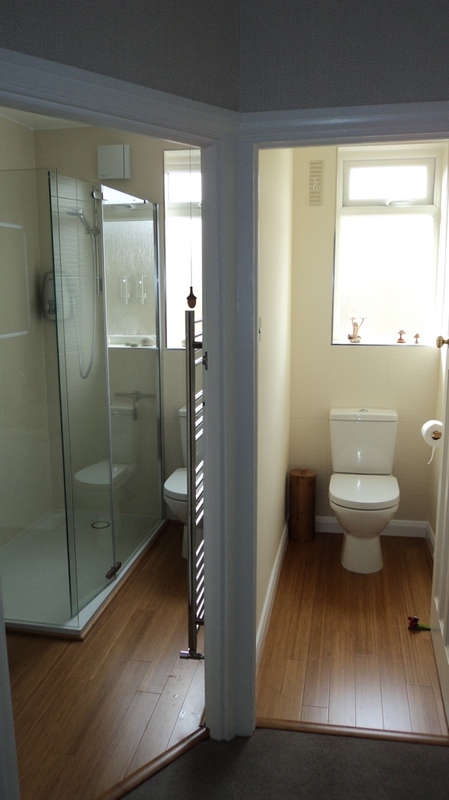 We were asked to quote for this job because of a referral and what the client wanted was a total modernisation of their outdated and leaking loft bathroom. 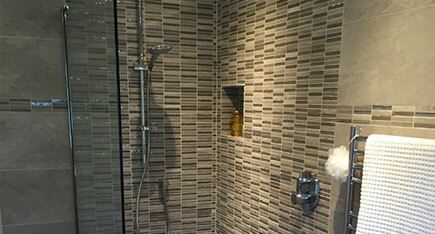 This bathroom was totally rewired so that we could create the LED lit recess within the shower and also the LED downlighter throughout and as a feature to the bathroom we built a wall to enclose the shower and fitted in a toughened glass panel with a LED strip light surround. 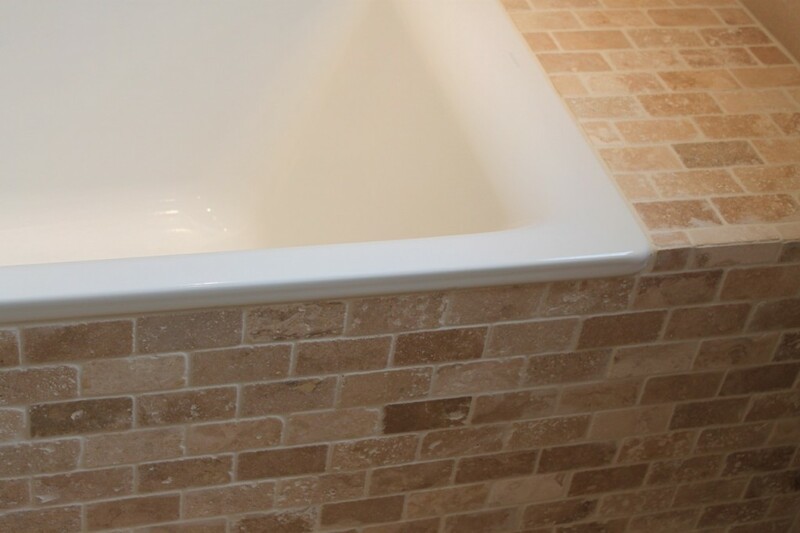 Under the windows for the bathroom a concealed cistern was fitted and we continued the boxing across the width of the bathroom to create hidden storage behind tiled doors.The tiled doors have been tiled to keep the tile module seamless. 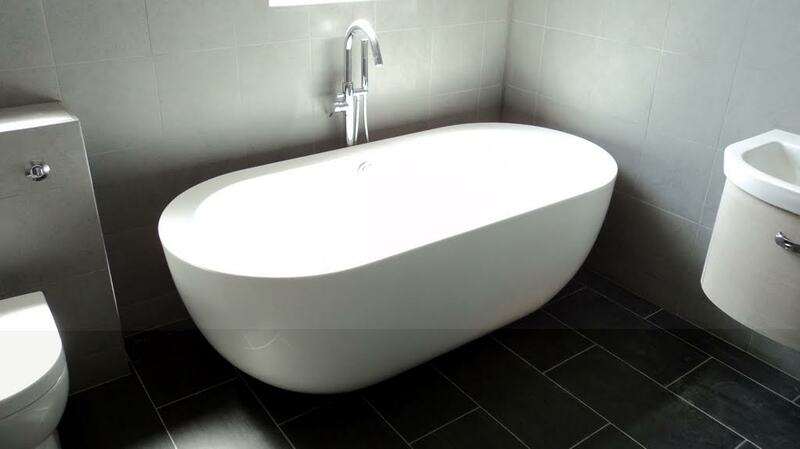 Beautiful light large porcelain tiles have been used on the floor and walls to maintain the light airy feel to the bathroom. 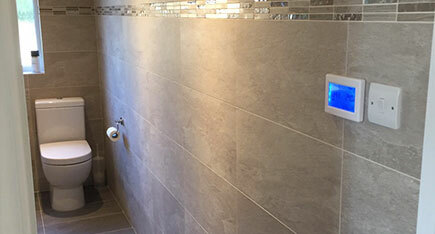 A modern electronic shower control with bedroom remote has been fitted to the shower. 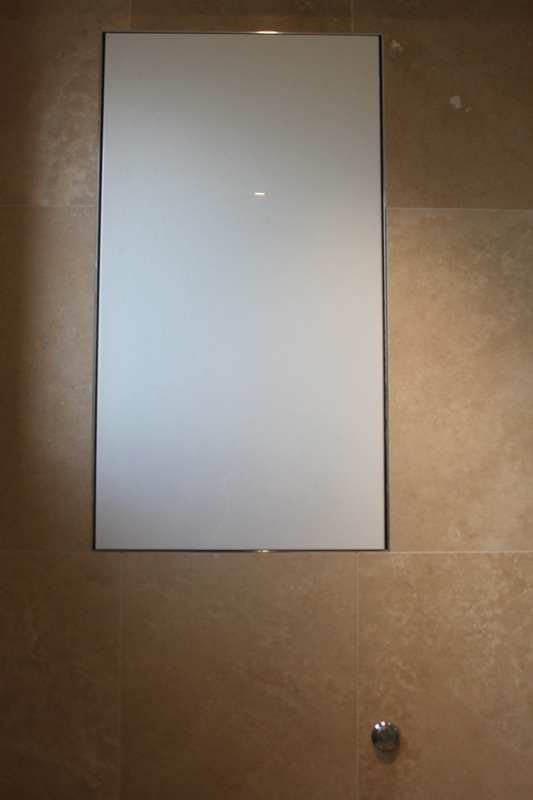 Underfloor heating and heated towel rail has been fitted. 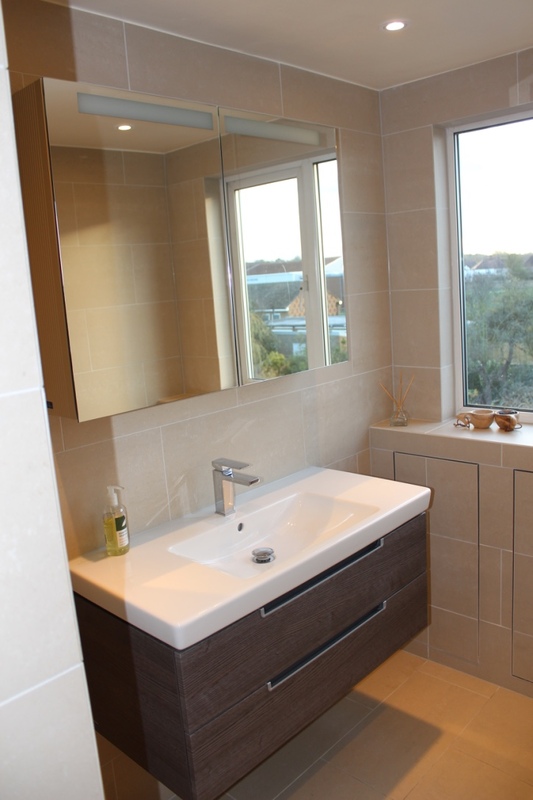 The bathroom can be given a lovely mood lighting effect by simply only switching on the recess and glass panel LED lighting. 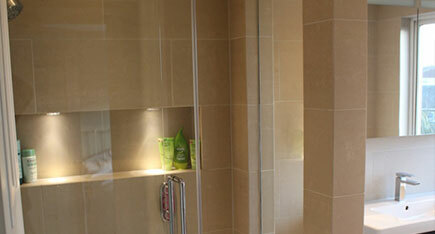 The lighting has played a fundamental part in the success of this bathroom refurbishment. 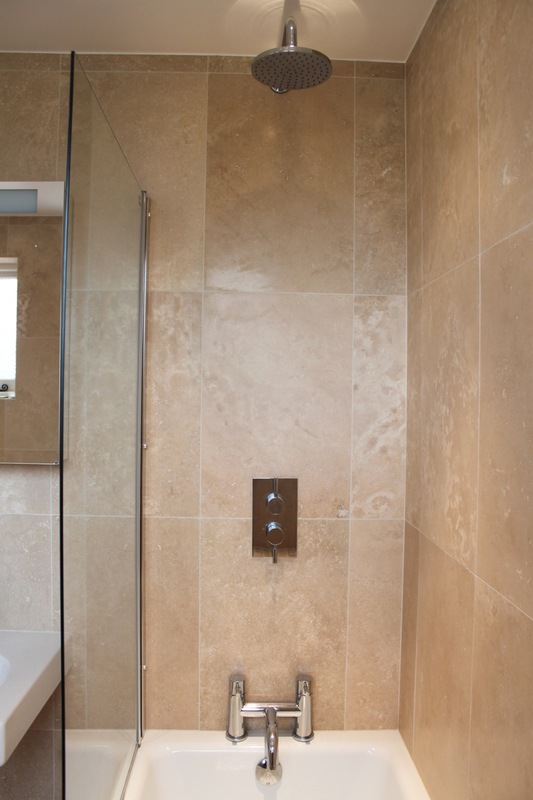 In this phenomenally beautiful home our client wanted to convert the first floor utility in to an en-suite bathroom. The utility would in turn replace the loft office. We removed the existing utility and exposed the old flooring. 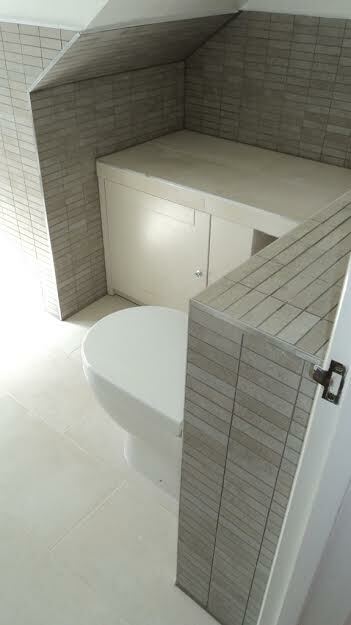 The floor structure had to be rebuilt and tensioned to allow for the bathroom to be built within. Additional insulation was also placed in the floor to help with heat loss from the garage below. 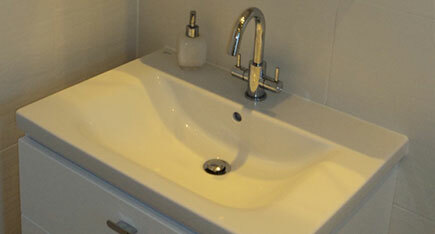 The bathroom was fitted with warm white LED downlighting and silent extractor fan. 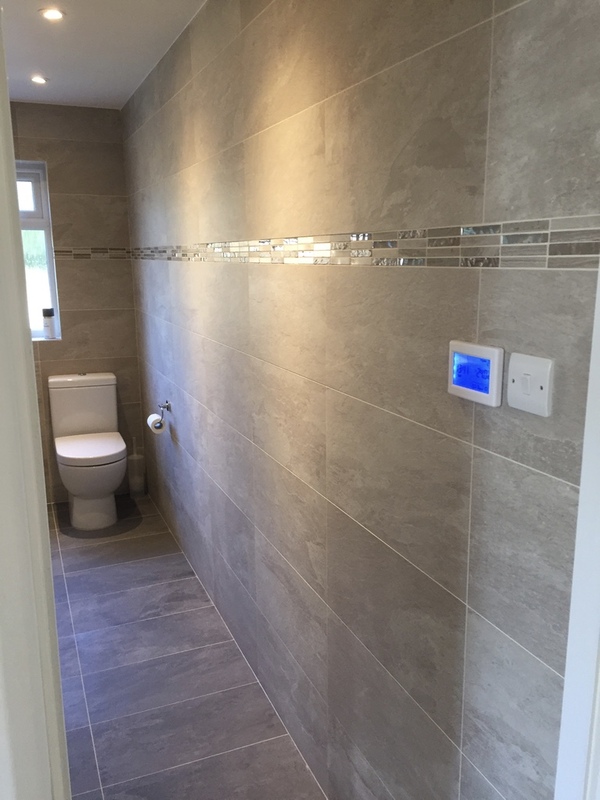 Underfloor heating cable was run throughout the bathroom and an aqua blue touchscreen controlling thermostat fitted. 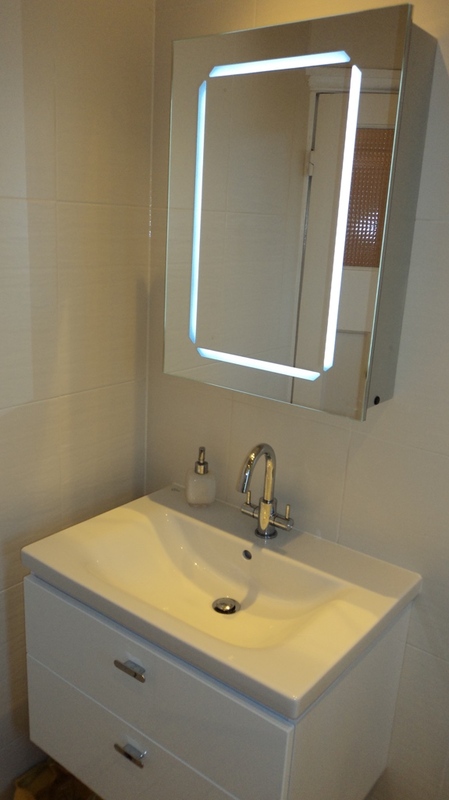 The large basin and unit were then complemented by the equally large LED backlit mirror unit which gives the bathroom additional depth. 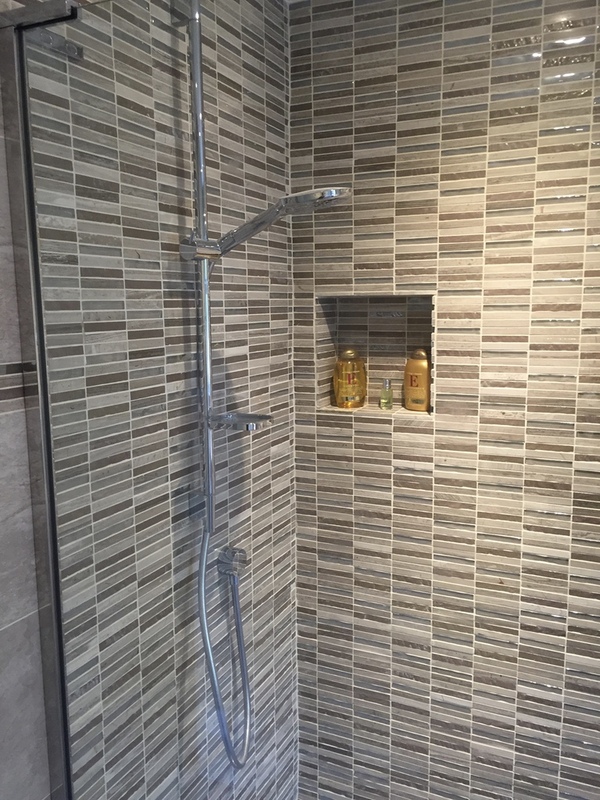 The floors have been tiled with a lovely warm grey tile and to tie in the mosaics used in the shower area, a lighter grey has been used on the walls from the floor to the ceiling throughout. 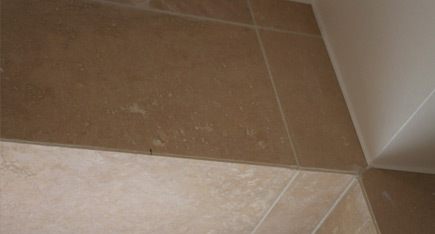 To make sure that the bathroom wasn’t overwhelmed by chrome, all tile corners have been mitred. 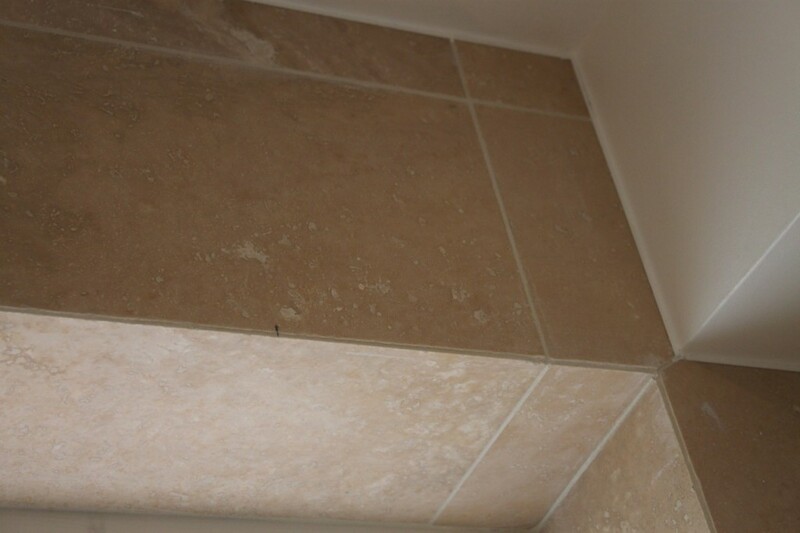 A horizontal gulley wet room tray has been fitted to keep with the modern design of the bathroom. 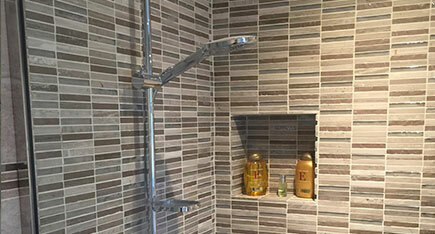 Once again a small recess has been created for storing hair products and lotions within the shower. 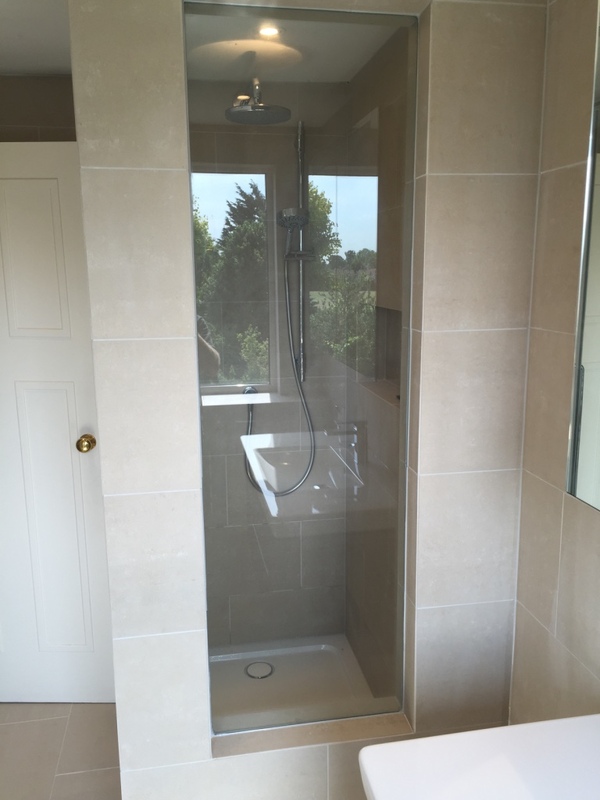 The clients taste in quality tiles and high end sanitary ware has really helped turn this in to luxurious bathroom refurbishment. 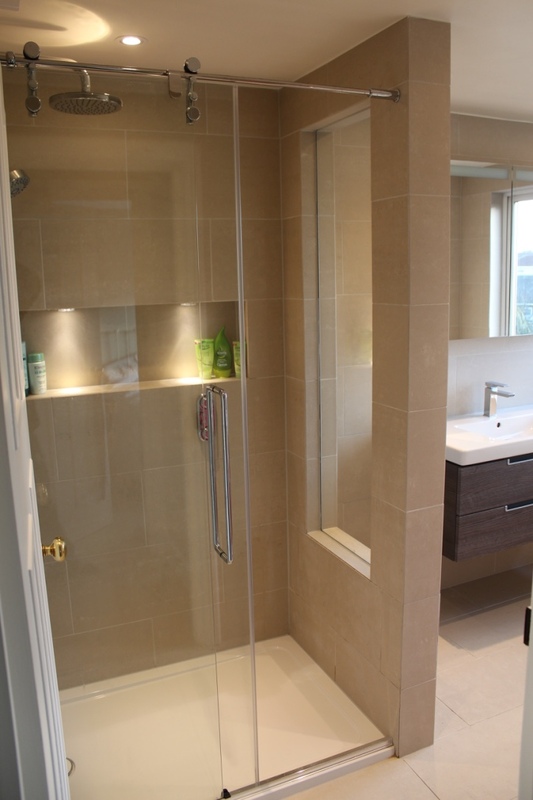 In this project we were required to break through between the bathroom and the adjoining WC to create a large open plan bathroom. A new doorway had to be built closer to the first floor landing to achieve this. 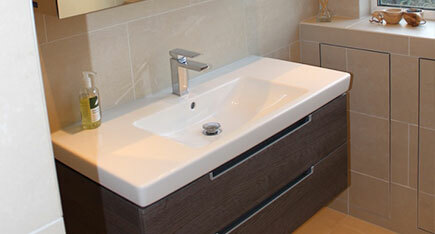 The clients wanted us to create a larger single bathroom for them in which they wanted to fit new modern sanitary ware. 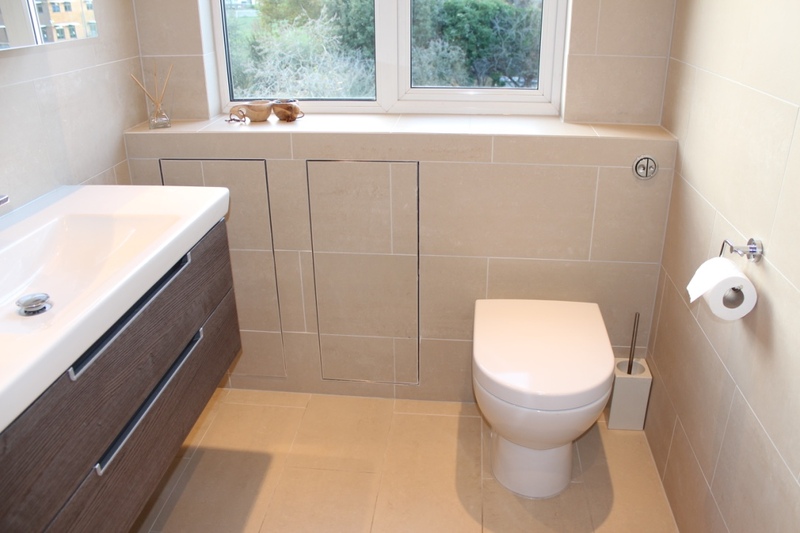 On entry to the bathroom we fitted a back to wall pan with a concealed cistern. The concealed cistern has been tiled in but we have left an access panel should we ever need to repair or replace any parts in the cistern. 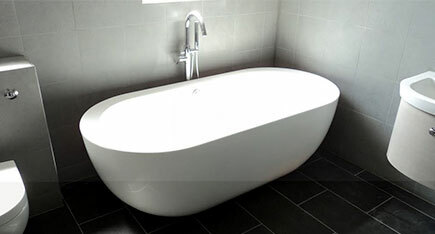 In the one corner of the bathroom a beautifully cultured free standing bath was fitted with floor standing pillar taps stretching over. 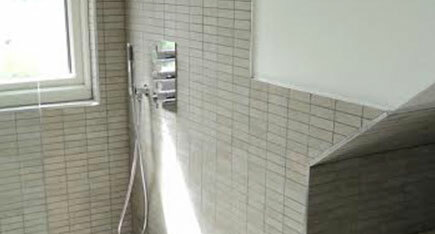 A large walk in wet room shower was also created. 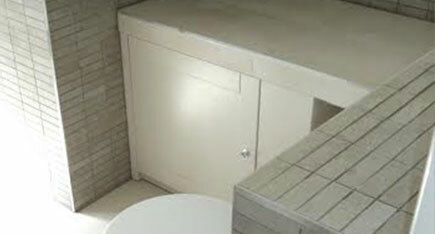 A small recess was also created in the wall to store shampoos, conditioners etc. 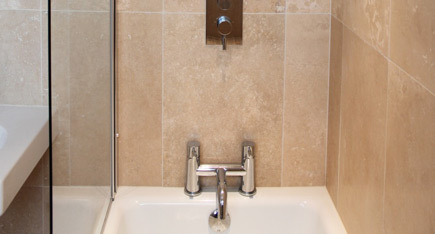 To help keep the bathroom dry, underfloor heating has been fitted throughout the bathroom and within the shower. 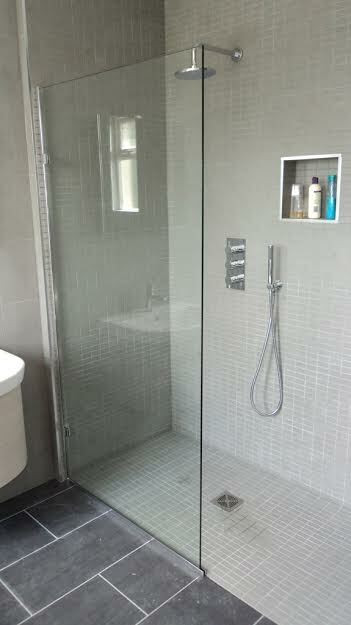 A easily accessible chrome towel rail was pace at the end of the shower. 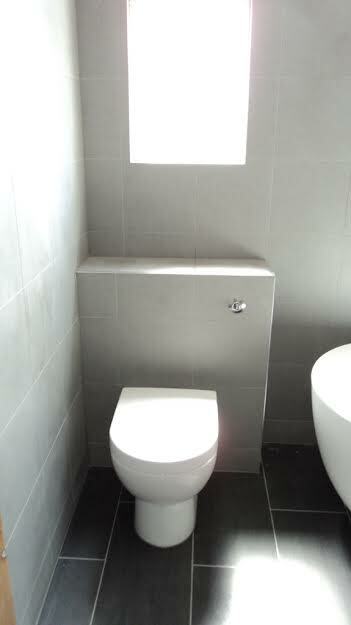 In this case the clients went for a dark grey porcelain tile on the floor with lighter grey porcelain tiles on the wall to help lighten the bathroom. 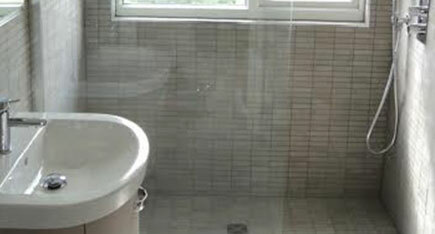 Mosaic tiles were used in the shower to give the shower its own character. 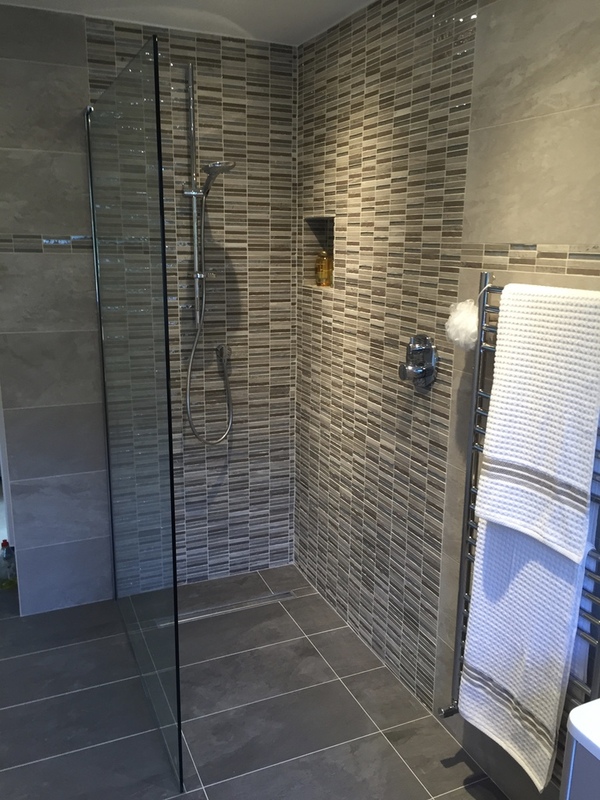 Following the success of the family bathroom project Evolution Bathrooms was asked to refurbish the loft bathroom as well. 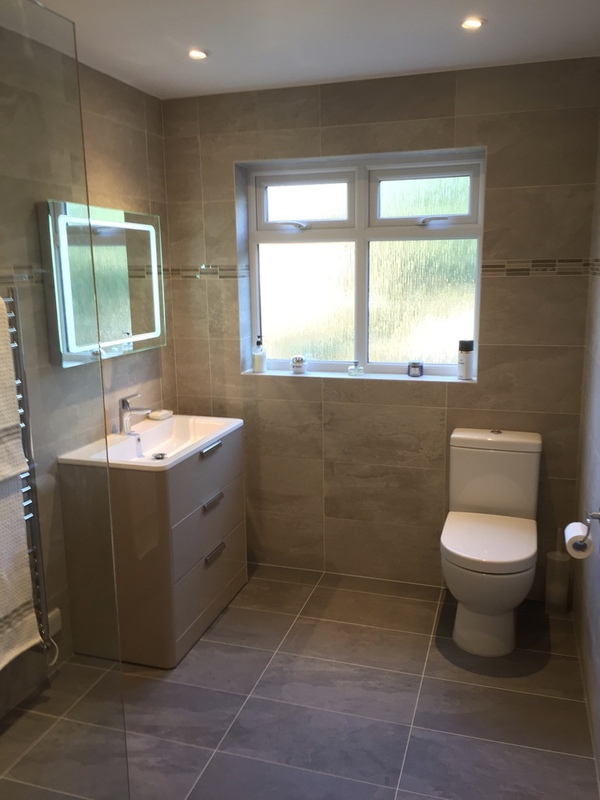 This is a project that was taken on by Evolution Bathrooms due to a recommendation give by a neighbour for a loft conversion done by Evolution Bathrooms. 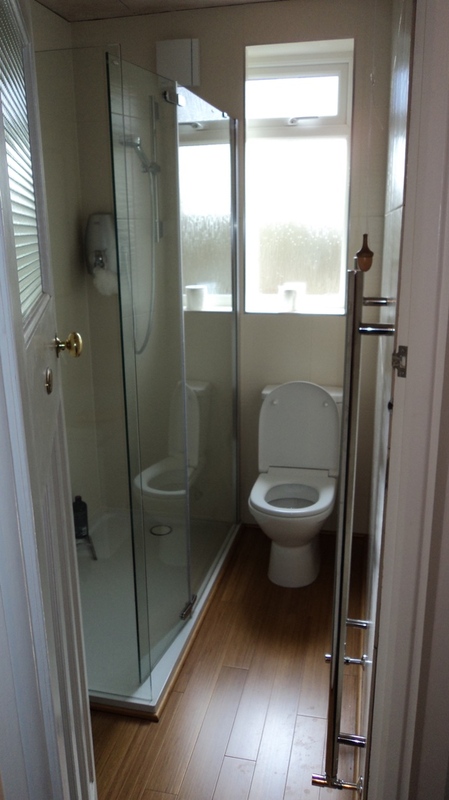 In this case, the clients decided that they would like to keep the bathroom and WC separate but very importantly introduced a new second toilet in the bathroom. 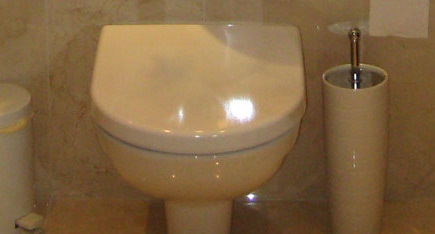 Our retired client’s main objective was to have a second toilet in the house. This wasn’t possible on the ground floor due to space constraints. 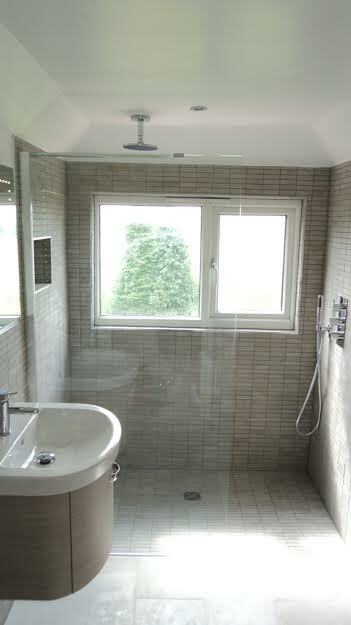 The bathroom was stripped out and bath replaced with a large walk in shower. 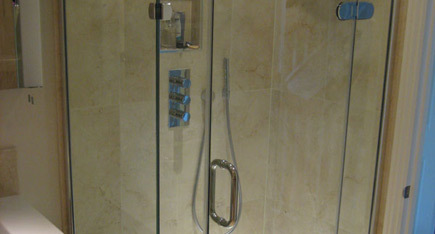 The shower was also fitted with a modern power shower. 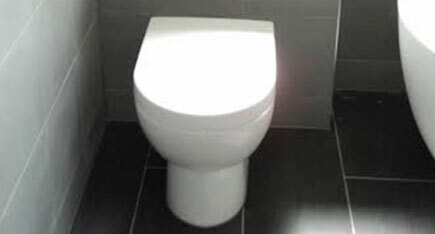 A new second toilet could then be fitted in the space created. 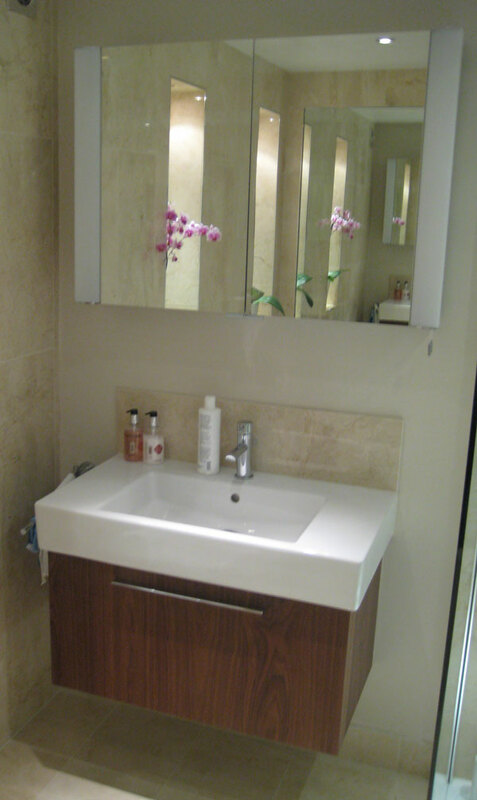 A wall hung basin with unit was then fitted behind the door with a beautifully lit mirror unit fitted above the basin. 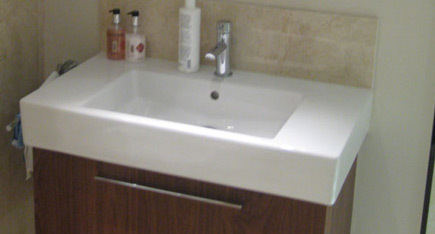 The unit also has a supply for an electric razor and electric toothbrushes. 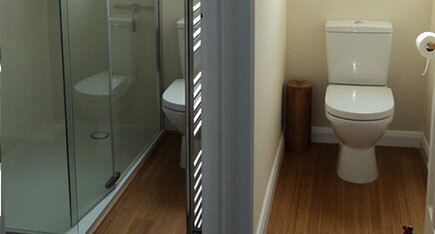 Both bathroom and WC were fitted with LED downlighters. 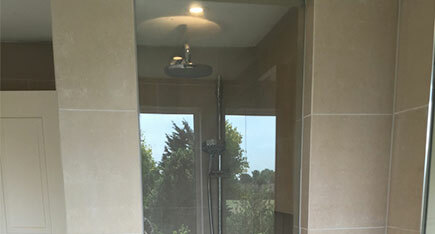 A humidity controlled silent run fan was also fitted in the bathroom to keep moisture and noise levels to a minimum. 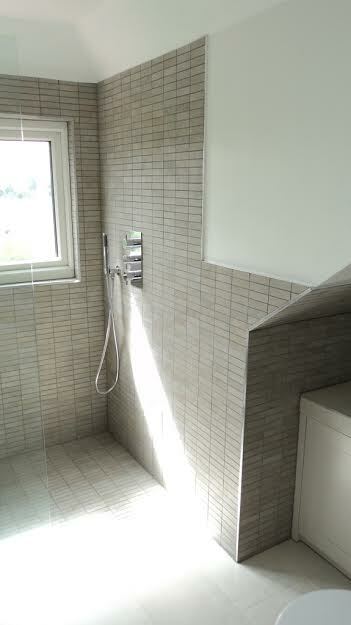 The walls have been tiled from floor to ceiling with a ivory coloured ceramic tile and the floor has been boarded with beautiful bamboo hard wood flooring. 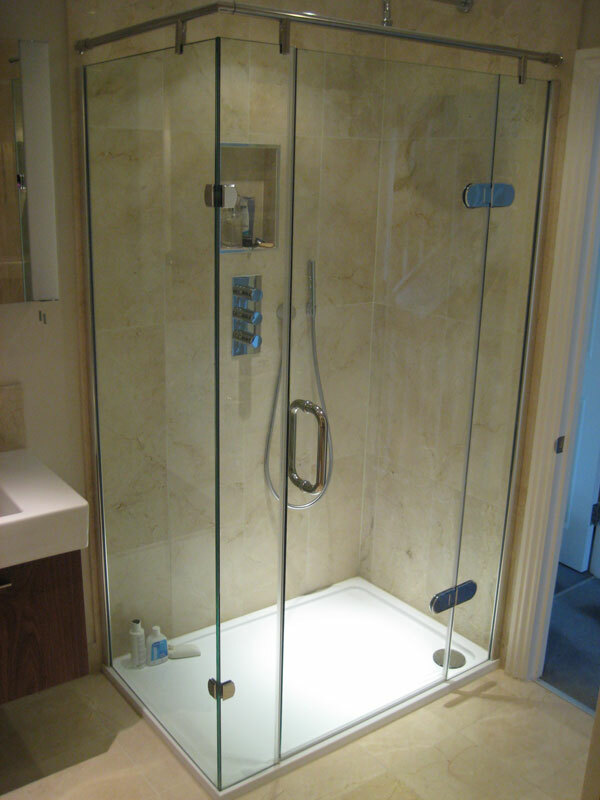 This was a complete Bathroom Refurbishment for a client in Surbiton. 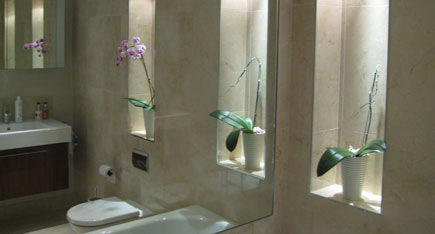 A number of recesses were created with downlights to add to the effect. 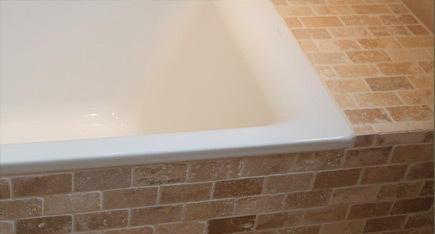 Beautiful Natural Travertine tiles, chamfered edges, professionally laid mosaics, built in cupboards with chrome trim.